I’ve added a new tea to my arsenal of healing teas – thyme tea. I gave up coffee years ago and tea became my new best friend. I have an absurd amount of teas in my collection but I love them all for different reasons and I often use them medicinally. When my husband and I did our annual cleanse this year, I was looking for some new teas, just to shake things up a bit. I had recently read about the healing property of thyme in the medical medium Anthony Williams book Life Changing Foods. Thyme has the ability to kill off bacteria and viruses, is a rich source of several vitamins, is a good purifying herb for the digestive tract, can ease headaches and muscle soreness, and is a good overall tonic for the nervous system. These are just a few things that this powerhouse can do. I’ve added thyme tea in to my repertoire. 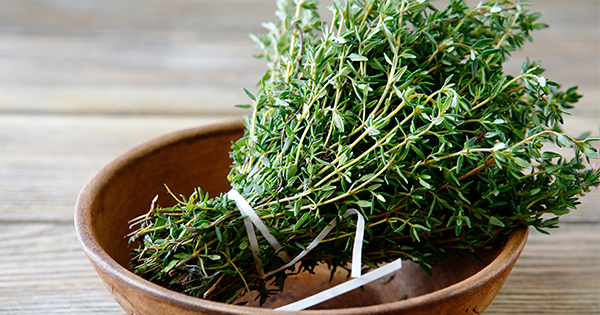 You can pour boiling water over fresh thyme sprigs and steep for about 15 minutes or so. I am more of a teabag/loose tea kinda gal, so I purchased some thyme tea bags. The flavor is a light herbal taste and I add a pinch of stevia. I’ve had it warm and cold; it’s tasty either way. Anthony has a great blog specifically about thyme tea if you want to read more about the nitty gritties of drinking it. I like his suggestion of infusing a large amount of water with it overnight and then sipping it throughout the day.